When you think of Italy, it’s usually places like Rome, Milan and Venice that grab people’s attention. But when I caught return flights to Turin for as little as £38, I jumped on the opportunity to discover another Italian city! 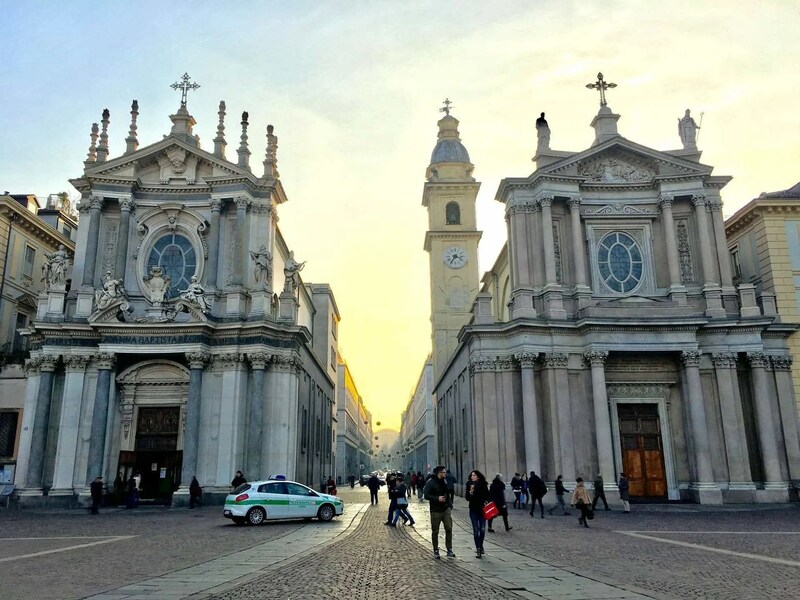 Here are some fun facts about Turin: it’s located near the Alps in the north west region of Piemont, Italy; it was the country’s first capital city; home of car manufacturer FIAT and home to football club Juventus. Most importantly, at least for me, Turin (or Torino as the Italians say) brought us the world’s first hard chocolate. If that isn’t working thanking for, I don’t know what is! 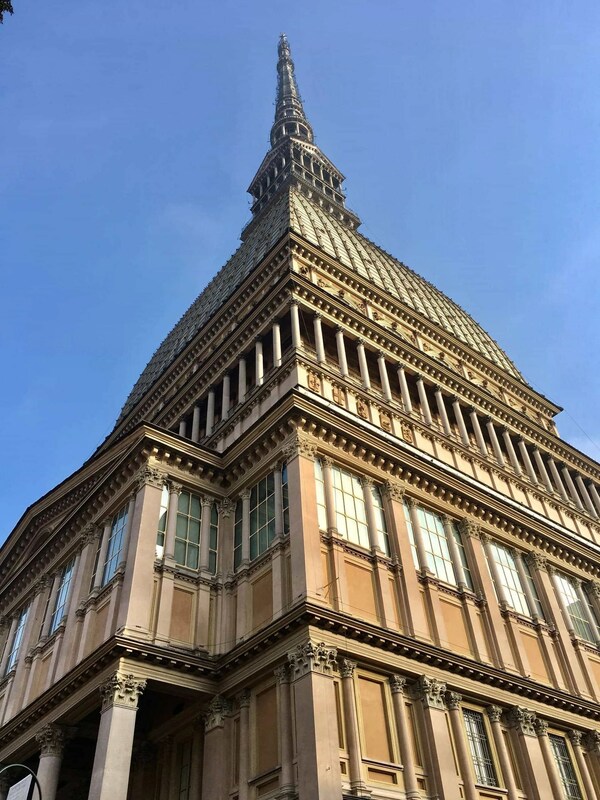 My wife and I visited for two full days, so I wanted to put together a guide of all the awesome things worth eating, worth seeing and worth doing for anyone heading to Turin. 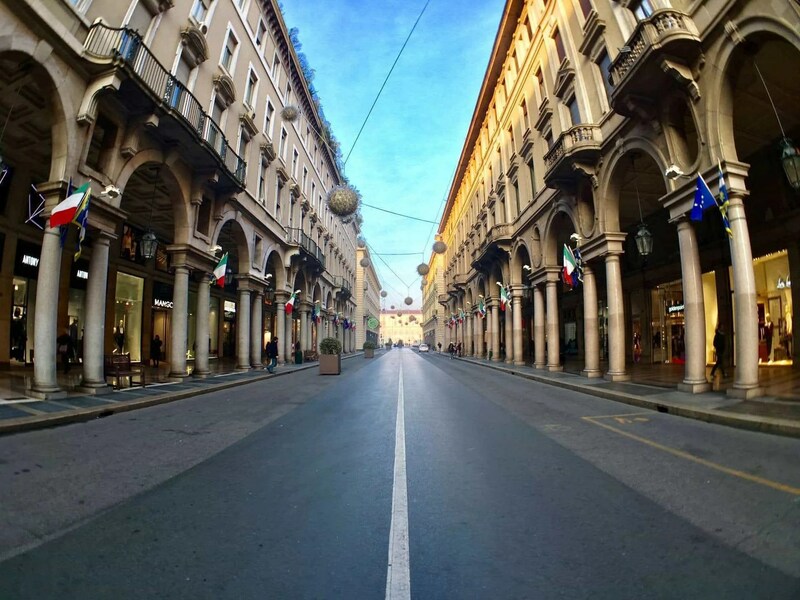 The go-to spot for shopaholics, Via Roma is a long street that stretches from Porta Nuova station up to Piazza Castello. It’s lined with grand arcades that shelter you from the cold and rain while you shop, and you’ll find a range of high-street and especially designer stores like Gucci and Hermes there. Those arcades are a prominent feature across the city; walk almost anywhere within the centre and you’ll inevitably be covered by them! Walk up Via Roma and you’ll come up to Piazza San Carlo, home to two beautiful churches called Chiesa di San Carlo and Santa Cristina. We weren’t able to go inside unfortunately, but because we visited this spot close to the sunset’s “golden hour” the backdrop to these two beautiful churches looked stunning. 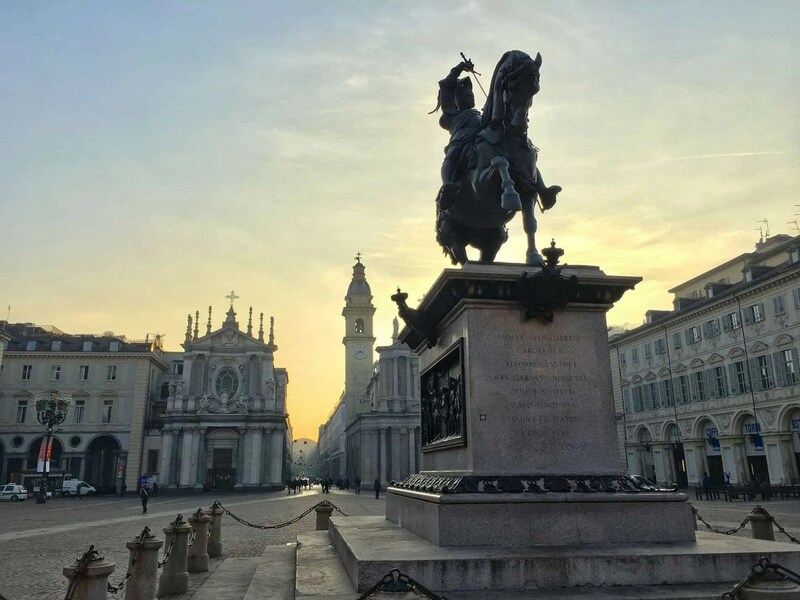 Arcades with cafes and restaurants surround Piazza San Carlo and in the middle you’ll find a Monument to Emanuele Filiberto. Carry on walking up Via Roma and you arrive at Piazza Castello. 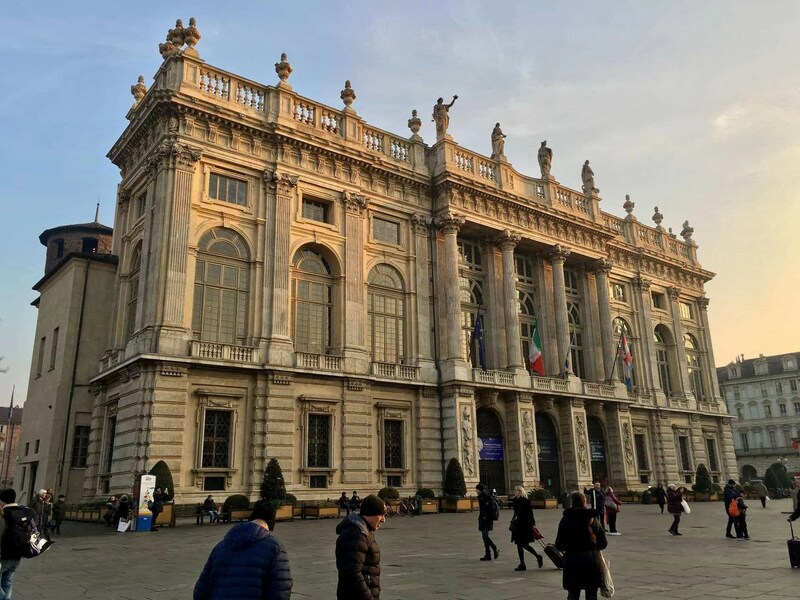 Here, you’ll find Madama Palace — previously the seat of the Italian parliament; now an art museum — and to the north side, the bold & grand Palazzo Reale (royal palace). Since we visited in December and Christmas looming, Turin made Piazza Castello feel that extra bit more special. To the left of Madama Palace there was a huge, real-life advent calendar that looked incredible at night when it was lit up. Then there was a massive Christmas tree made up entirely of lights; it really came to life at night with all its colours taking over the entire square. Behind the advent calendar was a small Christmas market where vendors sold things like pretzels, Italian hot chocolate, books and other things. 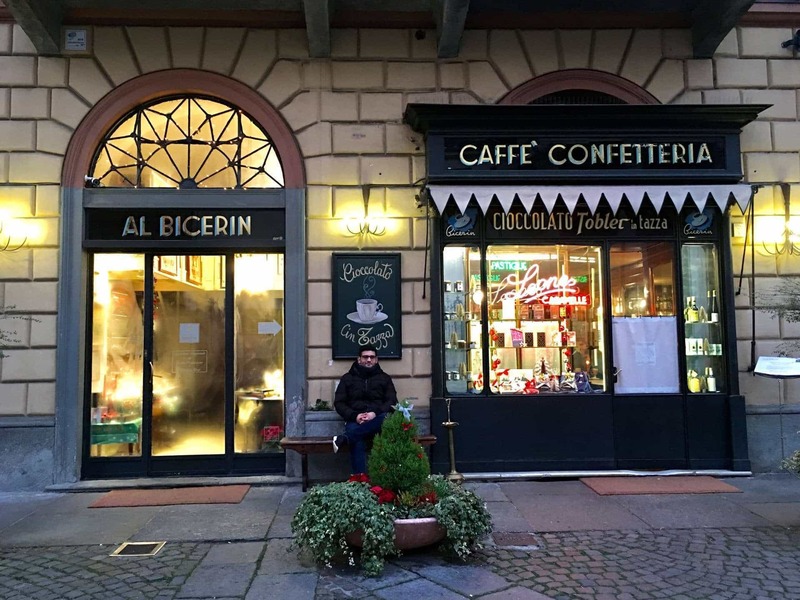 Visiting Caffe al Bicerin was one of our main goals when visiting Turin — no surprise there! — so we made it a priority after our first lunch. Further north in the city, this cosy little cafe is the home of Turin’s signature hot drink: Bicerin. Made from hot chocolate and topped with espresso and fresh cream, I could immediately tell why Bicerin is so popular. It’s incredible! 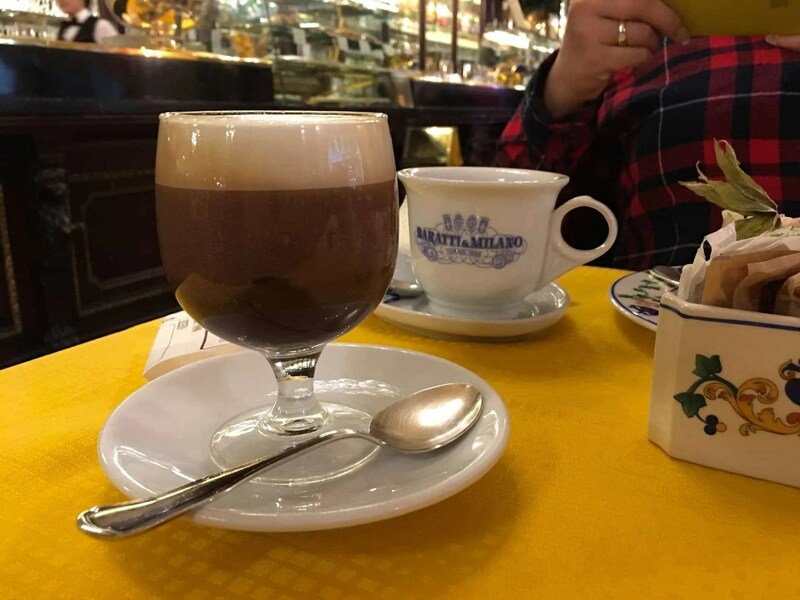 The chocolate is rich, but not as thick as your typical Italian hot chocolate so its perfectly and satisfyingly drinkable. And although I’m a coffee lover, I didn’t find the taste of espresso overpowering like I expected it to be, so rather than tasting like a Mocha it was far more like a hot chocolate to be honest. The cold, fresh cream adds an important and refreshing finishing touch with every sip. As if a decadent hot drink like Bicerin wasn’t enough, we also ordered a hazelnut cake with a hot chocolate sauce smothered all over it. Before you call us fat slobs, let me make it clear that we shared that slice! 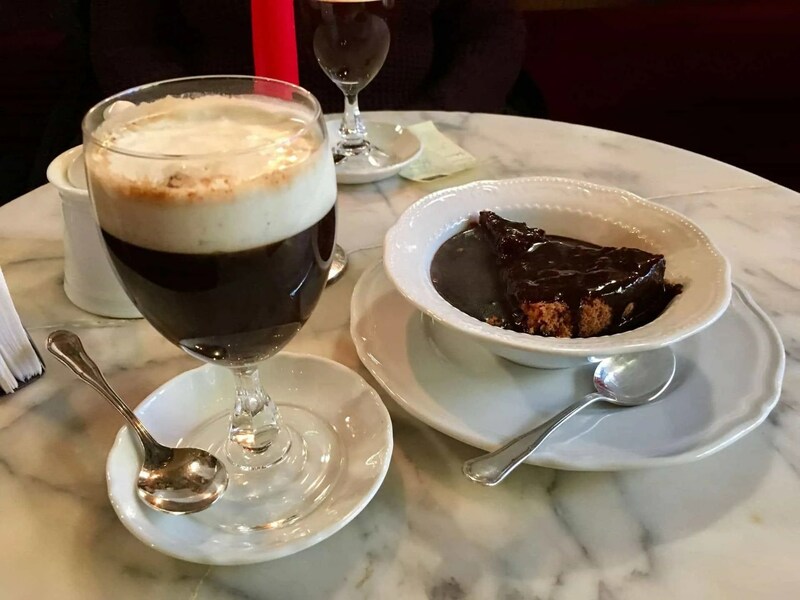 The Bicerin was fantastic, but we both really loved the well preserved and traditional feel of Caffe al Bicerin; after all, it’s been open since 1763. With its traditional wooden decor and cosy candle-lit tables, there was something very comforting and romantic about being there. Particularly on a freezing cold day like that. It’s a must-visit when you’re in Turin. Mole Antonelliana stands out like a black sheep in a herd when you’re flying into Turin. From the air — or just about any location in the city — it’s easy to point out the 167m high tower with its spire poking towards the sky. It was originally intended to be a Synagogue (which didn’t happen), so now it’s the national cinema museum instead. Being restricted on time we didn’t actually explore the exhibitions — and to be fair it’s not something we’re particularly interested in anyway — however we did pay around 7 euros to take the lift 85m upwards to the panoramic viewing deck. This is something I was really looking forward to, especially because of all the beautiful hills surrounding Turin and the vast views. Sadly, on our visit the fog was just too strong which meant we could barely see anything but I’d definitely encourage you to go if the skies are clear while visiting. 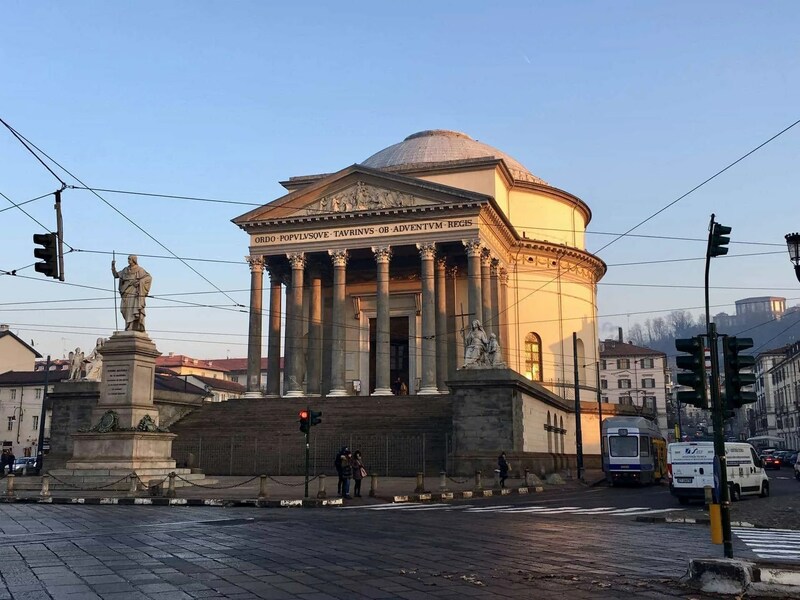 Cross over the bridge on the east coast of Turin, Ponte Vittorio Emanuele I, and you’ll come to a church called Chiesa della Gran Madre di Dio. One of the notable things people say about this church is that it supposedly holds the Holy Grail, but I just admired it for the picturesque setting across the bridge and beautiful, peaceful interior. 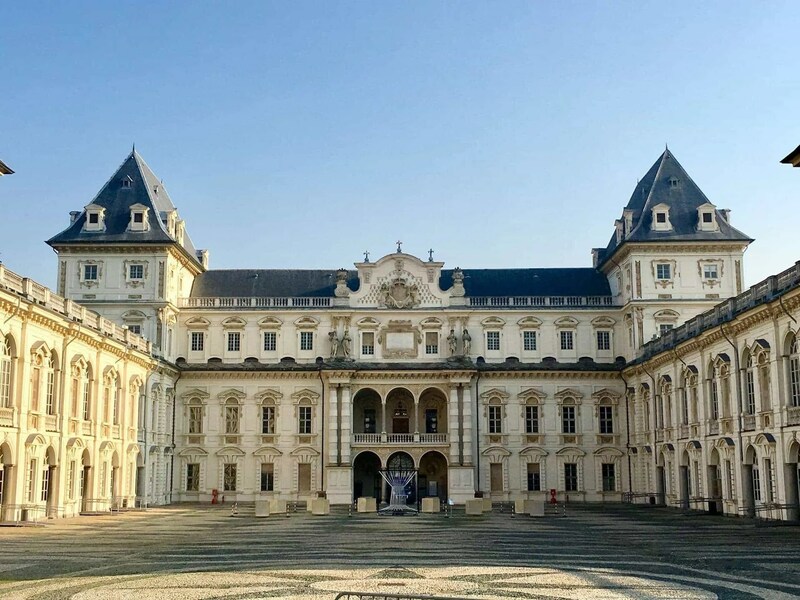 The castle now serves as seat of the Architecture Faculty of the Polytechnic University of Turin so we didn’t go and roam inside, although it’s still worth a visit if you have time. 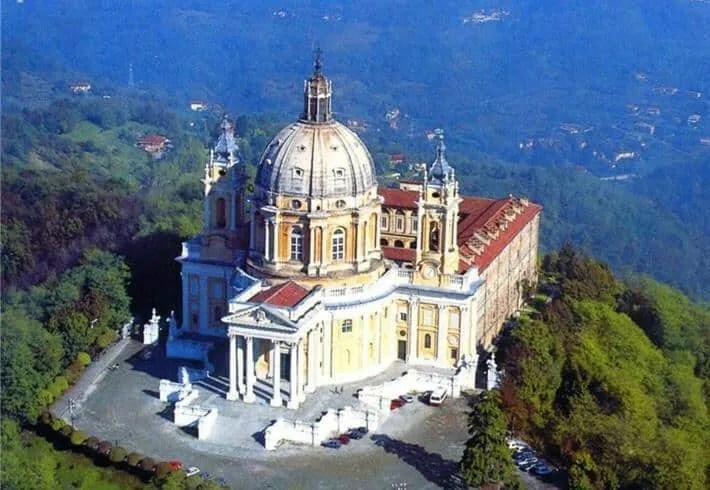 Perched on the hilltops just outside of Turin, the Basilica di Superga gives you some of the most stunning views over the city and the Alps. It was probably the place I most wanted to visit during our 48 hours in Turin, but thanks to the aforementioned fog it just didn’t seem worthwhile. Whether you’re going there to appreciate its history, visit the royal family’s tombs, the basilica’s architecture or just want the amazing views over the city — I’d really encourage you to plan this into your trip. 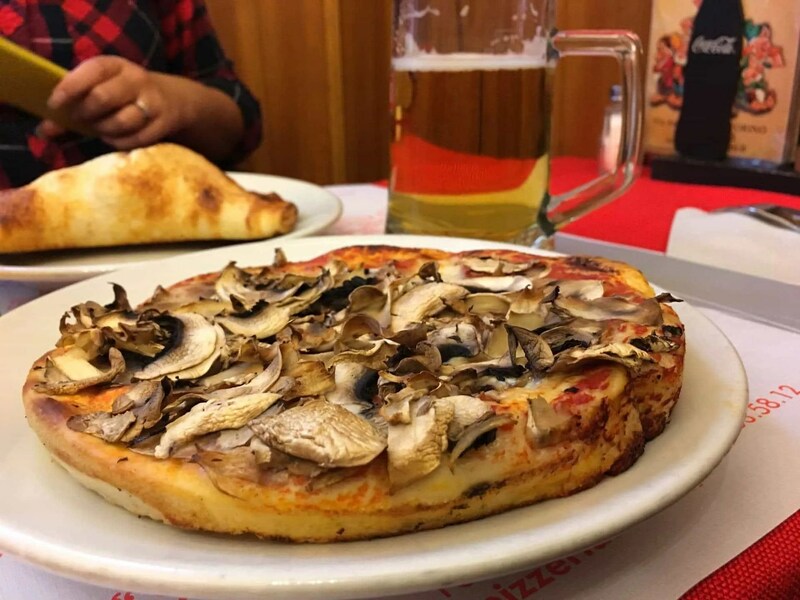 I was so glad we found this pizzeria in Turin. We had been roaming the city out in the freezing cold and after turning our noses up at a few restaurants that either looked too fancy or too dingy, we found this cosy, rustic looking pizzeria called Pizzeria Baita dei 7 Nani (referring to the 7 dwarfs from Snow White). There was no fancy furniture, menus or decor — just wooden tables and stools — and in a way I was kind of glad they didn’t speak English either. It made the whole experience feel more authentic. The pizzas were amazing by the way, and I’m not just saying that because I was hungry! I was surprised at the pizzas being deep pan to begin with — Italy does specialise in thin, stone baked pizzas after all — but the dough on this thing was incredibly soft and fluffy. Just my fork alone was tearing it all apart. Throw in a good old Italian Peroni beer alongside and it was a meal to remember. It might not be extravagant, but I’d recommend visiting this place just for the traditional experience. 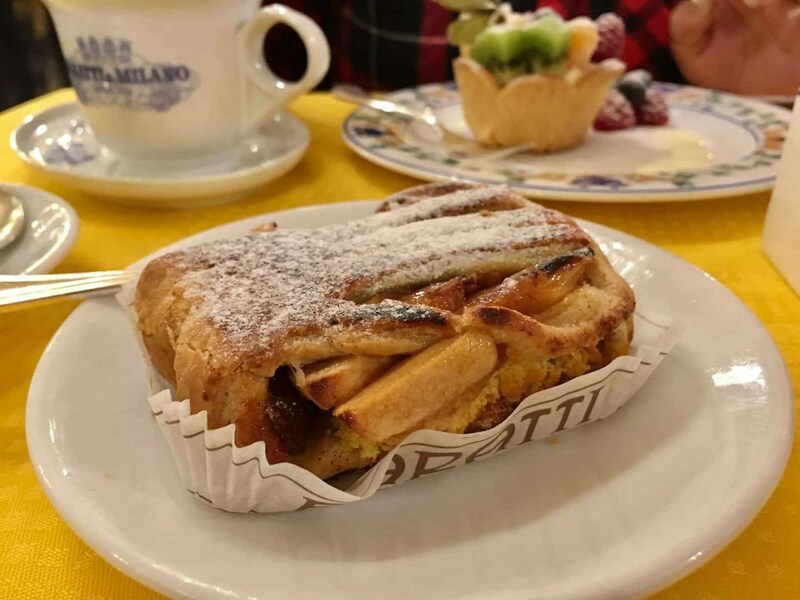 Since we didn’t get much of a chance to feed our sweet tooth with our hotel breakfast, Baratti & Milano caught our eye while we were roaming Turin. In comparison to the rustic and cosy pizzeria mentioned above, the well dressed staff, ambient music and ‘finer’ taste in furniture makes Baratti & Milano a more classy affair. Their pricing certainly matches up. My Bicerin drink you see in the photo above was about €6.5, and that hot chocolate, apple strudel and fruit tart you see below were between €6-8 each. Leaving aside the price for a minute though, the food was gorgeous. My strudel had a lovely warm and crisp pastry on the outside with apples and raisins on the inside. All it needed was some cream or custard to complete it! And the fruit tart was one of the best — if not the best — I’ve ever had. Geeta’s hot chocolate was rich and creamy, and although the Bicerin was nice, it seemed that nothing could beat the classic recipe from Caffe Al Bicerin. 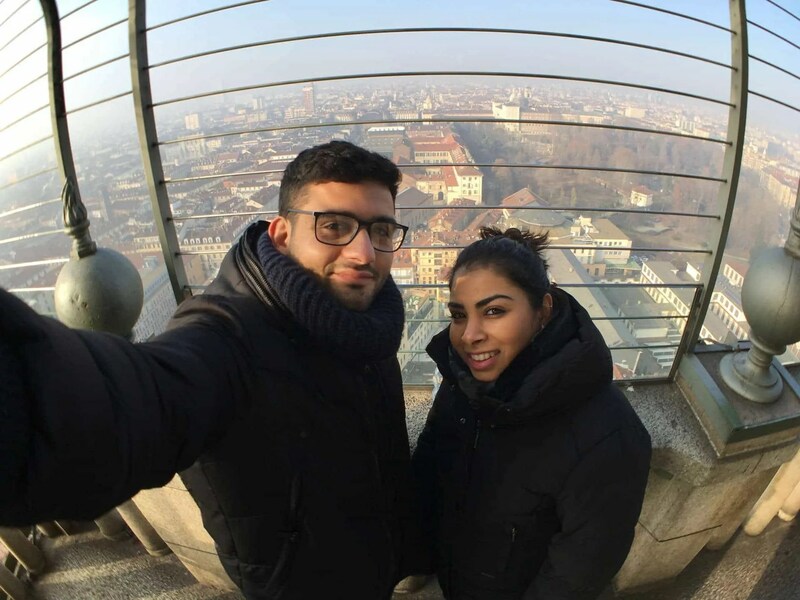 I went to Turin not knowing much about the city, its culture or what it has to offer. Having spent 48 hours there myself though, I can’t recommend it enough — it’s another of Italy’s gems. Whether it’s for a bit of culture, food or beautiful views, Turin has a good mix for an inexpensive city break.